Kate Moss Puts On The Ritz! I'm ready for some pink bubbles and monogrammed towels! Have a Ritzy Tuesday Everybody! Can she be more amazing! This is an absolutely STUNNING shoot! That first shot is my absolute favourite but they are all gorgeous! Although the one with the guy wearing the shoe on his head was strange...haha! Excuse me, I just died and went to heaven with the pink bubbles. I love that photo with the 2 dogs sitting on the chairs! I'd love to sit in the Ritz with my own two dogs, haha! She looks so young here! Is this The Ritz here in the UK? Oh my gosh, I've never seen her like this before, but I love it! those pics are insane! AMAZING! Wow the set up looks so opulent but I dare say it's very fashionably directed and styled. Kim, lets get a room at the ritz tonight and drink mimosas and gossip! Do you think they can give us the room with all the chanel inside? what an amazing editorial... she looks fantastic! Tim Walker creates such fantastical photo shoots and sigh, how does Kate Moss look better every year and she is older than me! 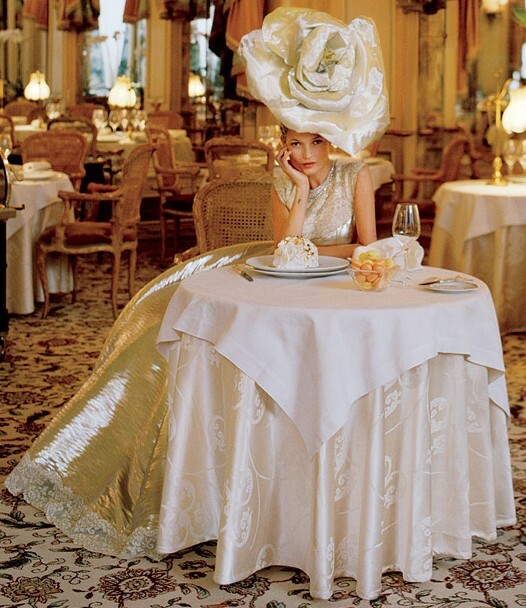 I love the life at Ritz Paris. It's the only Ritz I know. OMG! So pretty! I wish I lived in the era where I could wear these outrageously beautiful hats! :-) Hope you are enjoying the first day of Spring! These photos are so interesting and all her gowns are fabulous! Thanx for sharing them! Wooooooooooow these are unbelievably gorgeous!!! I love how some of the pics have an almost Marie Antoinette look to them, and others seem like 20s glam. Absolutely beautiful all around! Wowza! I'll take those feather shoes please! What a gorgeous editorial, the dresses are amazing, especially that second red dress. Swoonable! I love all of the photos but the pink bubbles in the last one are particularly dreamy! Enjoy your stay when you go Kim! oh gosh i so wish they have this photos in the vogue india issue!! !i will eat them with my eyes!!!! These photos are gorgeous! I've never even been close to the Ritz.. unless of course, we're talking about the crackers. lol ;) You're going to have such an amazing time when you go this summer! 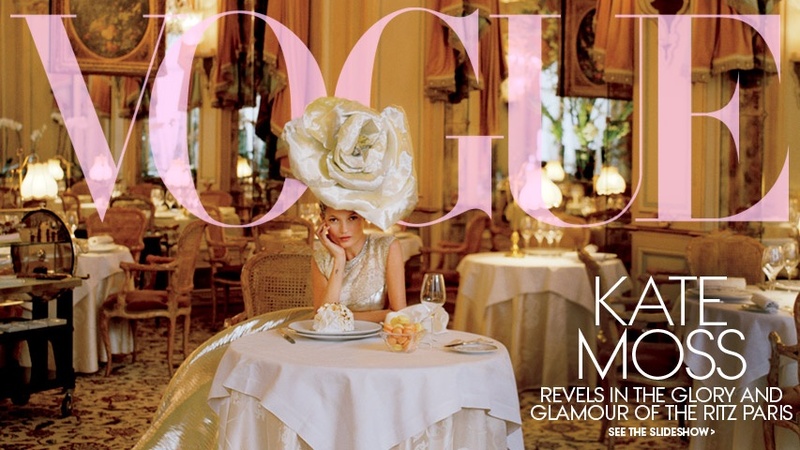 I always forget what a great model Kate Moss is-- I can barely recognize her in some of these photos! And I wish I had all those Chanel boxes... with things inside! What a great gift! I didn't know hotels had gift cards. 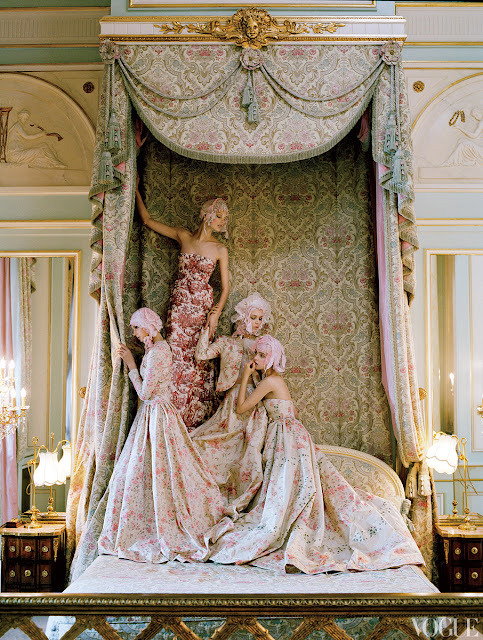 I love this shoot, it's very modern day Marie Antoinette. Love the one of her surrounded by Chanel boxes (wish it was me!) and the pink bath pix is perfection! Oh she is just the best... and how ridiculously fabulous is that rose hat - It's too much but I love it! Wow this is amazing! LOVE this post! Wow! I like the one where's she's in a pink dress on the mantle and the blue dress one with the little dogs! Thanks for the well wishes and encouragement Kim! Miss you too! It's been tough cause sometimes I feel like it's in my head but I'm working hard at finding a path to recovery and I hope it comes soon. I'm actually feeling pretty good today so I'm living it up while it lasts. km looks gorgeous in those gowns. the red ones are stunning. excited that u get to stay at a ritz!!! Kate is so beautiful! Love your blog and the fabulous pics!Just found you and will be visiting often! You have inspired me! Blessings! My favorite image is the bedroom full of Chanel boxes! I always look forward to coming to your blog and seeing the most amazing editorials. I absolutely adore this photo spread! 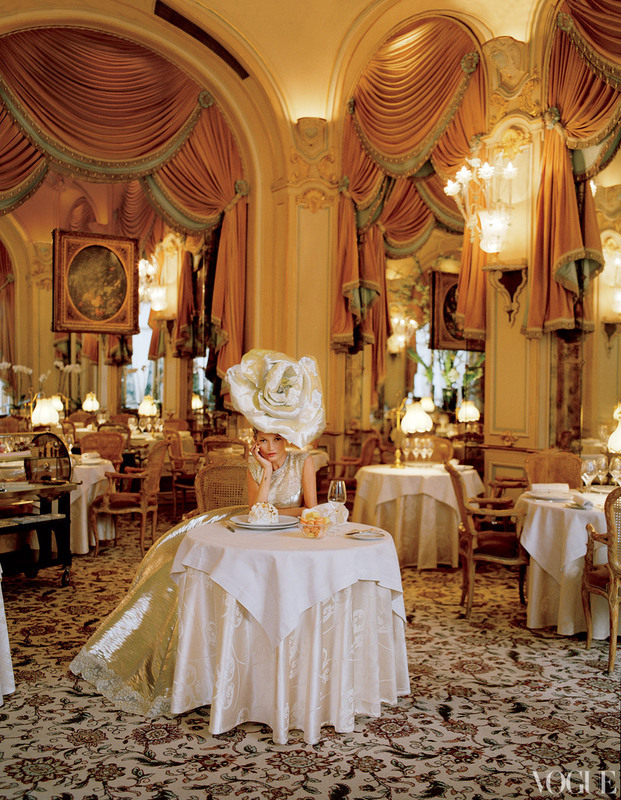 The Ritz is amazing and Kate Moss is beyond glamorous. I love all of the ornate beauty in these shots, so gorgeous! thanks for enlarging the photos...beautiful pics and gowns. love those blue lace booties! Oh yes pink bubbles, I would love that right now! 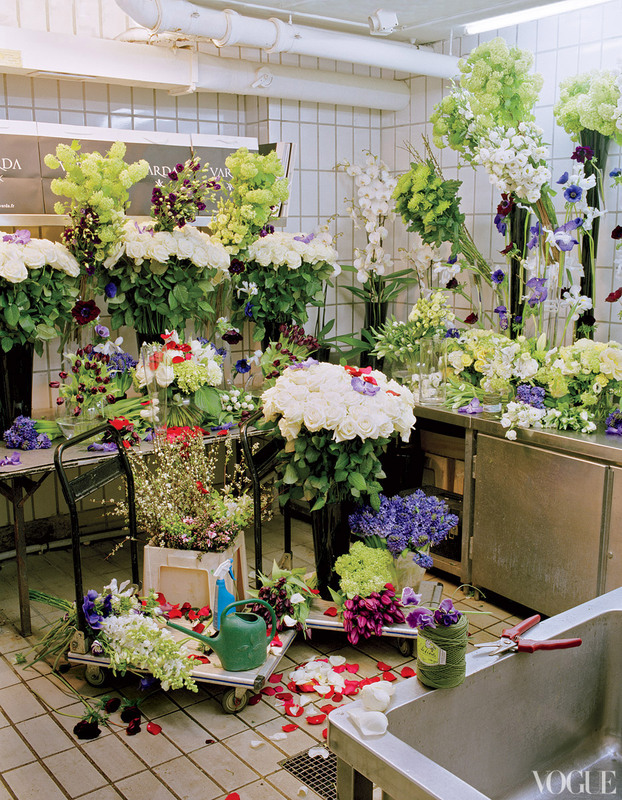 I'm the biggest Kate fan ever, so love this spread! Beyond gorgeous spread. . . the Ritz, the glamour, everything! What a most glamorous tutorial. no words.. what a spectacular editorial!!! so edgy, so classy, so vintage, so out of the box!! thanks for sharing.. The Ritz Carlton Hotel is one of the most expensive hotels in my country..
LOVE these pics Kim!! I wonder if they are going to be in the American Vogue! Can't wait to get the issue!! Maybe when you stay, you can wear a gorgeous hat like that too!! LOL!! Everything is glam - you are going to have a fabulous time! I have never been a Kate Moss fan, but this editorial has me drooling! I love everything about it! As crazy as that huge rose on her head is, I love it! These are great photos..I especially love the ones where she's standing on the mantle. As much as she can be kinda yucky off-duty, she sure knows how to WERK it in front of the camera! 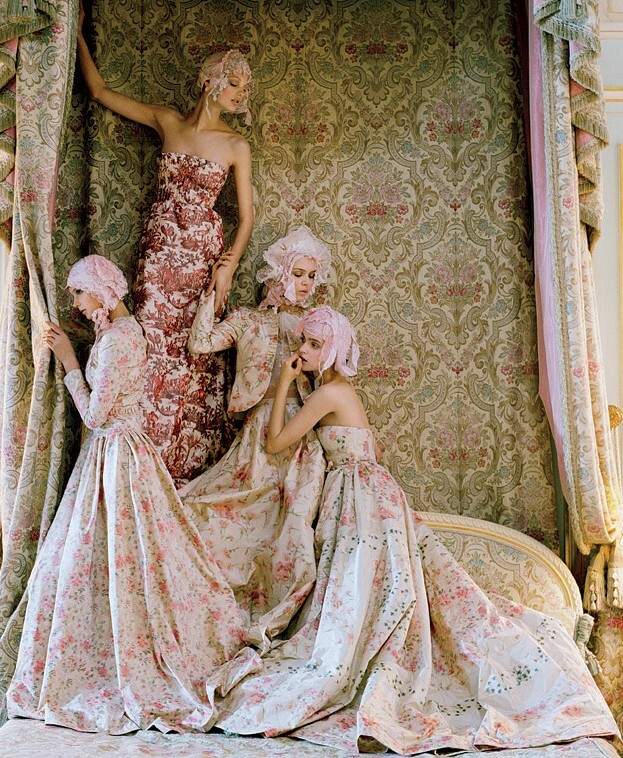 this editorial is breathtaking, i love the red dress and the fuchsia one. She will always be one of my favorites. Get Your Flirt On...With Harvey Prince! Blogging is like wearing a pair of heels! t+j Designs: Make a Statement!